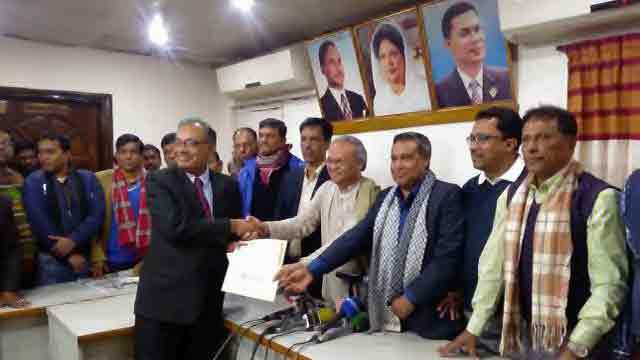 Dhaka, Jan 14 (Just News): BNP started selling nomination forms for the upcoming Dhaka North City Corporation mayoral by-polls. Five candidates willing to contest the upcoming by-polls of the DNCC with BNP tickets collected nomination papers today, sources at the BNP’s Nayapaltan party office said. They are BNP central executive committee member Tabith Awal, Dhaka city (North) unit president MA Quayum and its assistant publication secretary Shakil Wahed, the party’s central leader Asaduzzaman Ripon and expelled BNP leader Major (retd) Akhtaruzzaman. Tabith is son of BNP vice chairman Abdul Awal Mintoo. BNP-blessed candidate Tabith ran against AL-supported contender Annisul Huq in the last DNCC election after the AL-led government split Dhaka city corporation into two in November 2011. In the last election held on April 28, 2015, Tabith boycotted the polls on the voting day, alleging widespread rigging. Aspirants had been asked to collect those within the day and submit those to the party's central office by tomorrow. Yesterday, eight people -- four businessmen, three teachers and a poet -- collected forms from the Awami League seeking party ticket for DNCC mayor race. No AL leader was among them and yesterday was the first day of the sale of AL forms. The last day is tomorrow. By-polls to the DNCC mayor post will be held on February 26. Elections in the 36 new wards, which have been included in Dhaka north and south city corporations, will also be held on that day. The mayor post became vacant after Annisul passed away in London on November 30.